The restaurant formerly known as Marshall Free House in Greensboro is getting a brand-new concept. Next month, it will become The Traveled Farmer, led by Chef Jay Pierce and mixologist Mark Weddle. The team, along with Marty Kotis, will emphasize local foods, highlighting farmers and seasonal produce, and best of all, they're even planning to have a mini farmer's market in the restaurant! "Why wait in farmer's market lines on the weekends?" they thought - you can stop by the Traveled Farmer for lunch or dinner and pick up some collards and butter while you're there! They'll even have a case of prepared foods like pimiento cheese, chicken salad and housemade crackers. They've pretty much thought of it all. And if their recent preview is indicative of the creativity and quality of food they're going to offer, we're all in for a real treat. 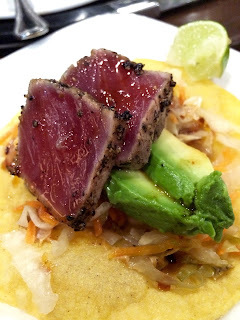 The menu is a sampling of dishes from around the globe. 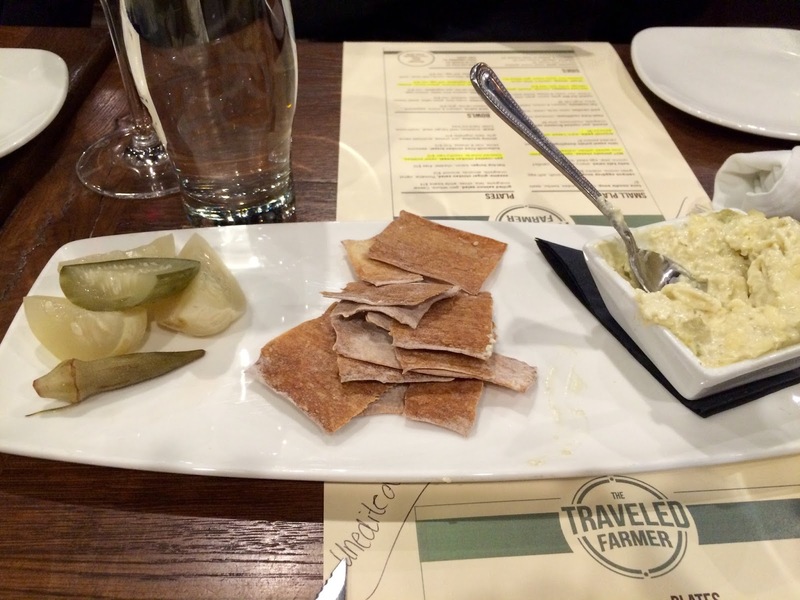 Chef Pierce remarked that people tend to associate "local" and "farm-to-table" restaurants solely with Southern food. This is not always the case. Just looking at the menu, I recognized dishes from Mexico, Korea, China, Italy, and since we are of course in NC, the South. "NOT Pimiento Cheese" combines aged white cheddar cheese with green chiles, and is served with housemade crackers, pickled okra and pickled green tomatoes. This is my kind of spread - spicy, tangy, with a bite, unlike some heavy mayo-based pimiento cheeses that tend to be on the sweet side. The dish got its name because too many people were asking where the red pimientos were, and didn't think the green chiles were an acceptable substitute for it to truly be considered pimiento cheese. Call it what you want, it's fabulous. One of my favorite dishes of the night was the "Street" Shrimp, though they were more like Shrimp Tacos or lettuce wraps. 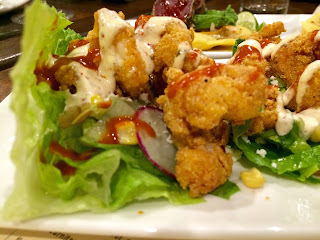 The fried shrimp had an incredibly flavorful batter - some of the best I've ever had - and believe me, growing up in the South, I've had a lot of fried shrimp. About 3 or 4 beauties rest in a lettuce leaf, with Valentina hot sauce and a creamy white sauce drizzled on top. Blistered corn, queso fresco and sliced radishes round out the dish. Three come in a serving - they are incredibly satiating. You could easily make this a meal. Rare Tuna Tostadas present three beautifully rare pieces of ahi tuna on a crisp tortilla shell. The chipotle glaze and ancho aioli bring some serious heat, but they're more spice-forward than heat-forward, if that makes sense. Avocado is nice and smooth and cooling. Cabbage provides crunch, and a squirt of lime is just what you need to balance the flavors. You get two in a serving here. 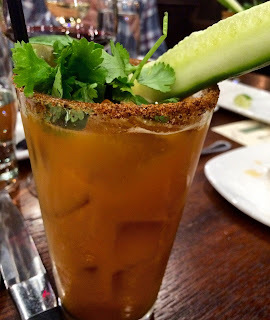 Mixologist Mark Weddle is pretty well-known in the national Bloody Mary competition world, so when he appeared with a tray of Reposado Tequila and Carrot Juice bloodies, I could hardly contain my excitement. The rim is Old Bay seasoning, and the heat comes from horseradish and black pepper. This drink is called "The Wild Hair" and it is absolutely wild in the best way. 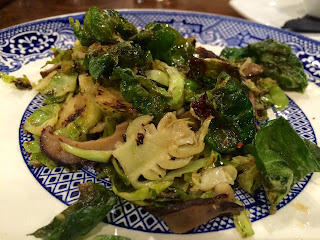 Brussels Sprouts could NOT be more trendy right now, which is lucky for me, because I love them. Chef Pierce makes his shaved, pan-roasted Brussels a satisfying vegetarian meal all on its own. He adds mushrooms for texture and meatiness, sherry vinaigrette and chile for depth of flavor, and the best part - salty, crispy leaves for crunch. This dish is a fabulous texture ride. Broccoli Pasta sounds just like what you think it is, but it's so much more exciting because of the warm Caesar vinaigrette and fresh pecorino cheese. 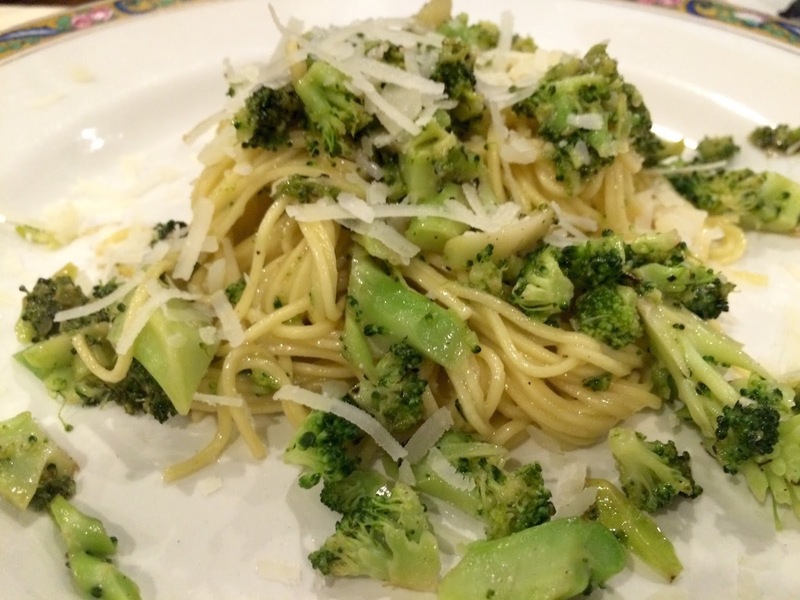 Angel hair pasta from Drake's in High Point gets coated with these tasty flavors, with a pop of al dente broccoli for texture and color. Another satisfying vegetarian option, that even tastes light and healthy. As if we had room for much more, we moved onto the entrees. 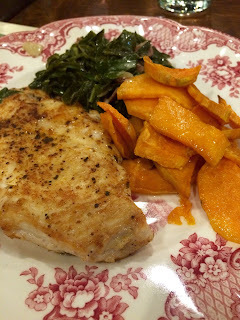 I think Chef Pierce served us his pan-roasted Chicken Breast with Sweet Potatoes, Creamed Collards and Country Ham to remind us that there is beauty in simplicity. The chicken was perfectly seasoned (with just salt & pepper I believe) and was so tender - not overcooked. The collards screamed flavors of rosemary, which caught me by surprise, but anyone who thinks they don't like collards are sure to enjoy these. The sweet potatoes were cut into rounds and sauteed, perhaps flash fried, but otherwise left in their natural state. The pretty pink china plate might have been the prettiest part of this dish, but it's a reminder that you can taste the love in simple dishes, and they can be truly pleasing. Perhaps my favorite dish of the night was the Korean Bowl. This is something I don't make for myself at home (I don't make most of what we ate at home, either!) but this felt like a special treat. 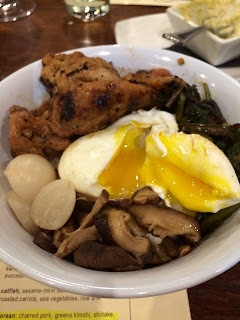 Charred Pork with Gochujang, Greens "Kimchi", Shiitake Mushrooms, Pickled Turnips, and a beautiful Soft-Boiled Egg sat atop a bowl of delicious sticky rice. A dining companion remarked that the rice was not sticky enough for her liking, and that it crumbled too easily, but this diner didn't have an issue. In fact, I liked that it was only slightly gummy, and thought the flavor was fantastic. Again - I'm not sure how many times in my life I've thought rice was so tasty! Beauty in simplicity! The greens "kimchi" was super salty, not tangy like you'd expect to find with kimchi, but the pickled turnips gave me the acid I was looking for. And the best part was breaking the soft egg yolk to coat everything with its beautiful yellow blanket. Just when we thought we were about to pop, mixologist Mark appeared with little saucers with a few Cocoa Puffs - yes, the kid cereal - in each one. This cereal fanatic was freakin'. We were instructed to pour a carafe of vodka, butterscotch schnapps and kahlua on top of the puffs, and drink out of the bowl, as if we were drinking the cereal milk like we did in our youth (or this morning). The whimsical drink is aptly named The Cereal Killer, and it truly is killer. 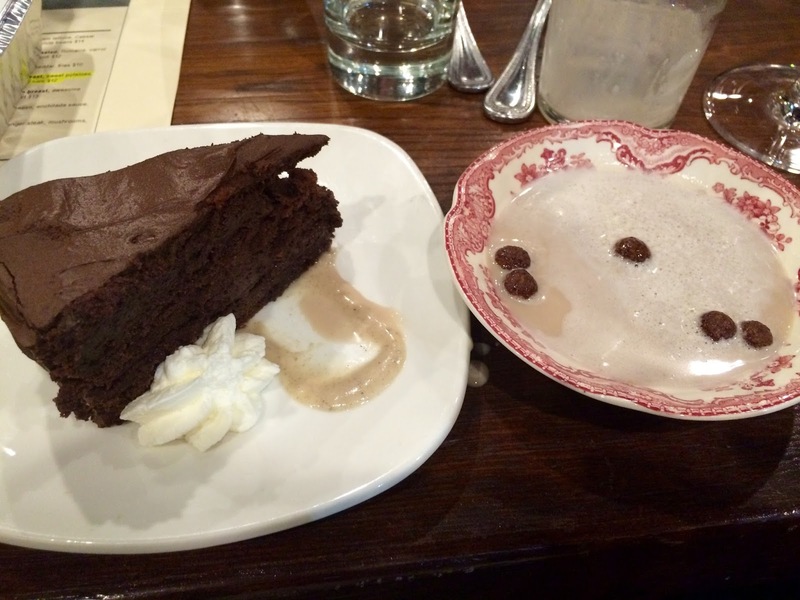 Alongside, we enjoyed a chocolate cake with chocolate mousse frosting, to make it extra moist and rich. The best part was the earthy banana caramel that cut through the richness. Are you impressed? I left with my jaw still on the floor. I cannot wait to see what else these guys have in store, and to try other fabulous-sounding items on their menu, like Eggdrop Soup with a soft egg and cilantro, or the Sweet Potato Dumplings with Blue Cheese and Candied Pecans. Their hard work on this new concept is evident. They should be very proud, and you should be very excited.